Infographic marketplace to buy affordable infographics for your website or sell your infographics with a stock photo license. Creating an infographic is not for the fainthearted. When you have done a little research you might think that making an infographic is easily done, right? Wrong. Before going to work with the new creation, you should definitely follow the next 6 steps. Data is key when making an infographic, and the most beautiful images and drawings are not. So, first you take notice of the information you have. Take the time to research and learn what the core of the information is. Where does it come from? What is it about? What methods are used? Why is it interesting? Why is the data unique? In one hand you have the data from step one. In the other hand, you need to have the target audience to move on to step 3. For whom is the information most relevant? If your infographic is about the best SEO Tips For 2017, then website designers might be a good target audience. I wider audience would be: people who own a website and are interested in ranking higher in the search engines to attract more customers. Take your time to learn to understand the target audience and how to ‘get to them’. In a world as fast as ours where no one has time, an interesting topic has to be straight to the point. So don’t twist around the core message, come up with the most important information on your infographic first. Like stated before, determine the goal of the infographic. When there is no goal defined, the reader will not be able to understand what the infographic is about and definitely not share it on their social media account. And that is the main goal for the internet marketeer: sharing! Summarizing difficult information to make it better understandable to anyone, despite the educational level. Presenting stupid information in a funny way. Now we have the data and the end goal of the infographic, it is time to give the infographic designer the order to start working. But, do we give the infographic designer a free hand or do we steer him or her in the direction we would like him or her to go? Is is quite normal when you hire someone for a special task that this person will receive the order crystal clear. The designer also is in need of structure and overview. A sketch of what you have in mind might give a big hand. A sketch is a wonderful tool. In fact, it makes perfect sense! You have an image in mind that should become the infographic. And the designer for sure has another image in mind based on the information you gave. You know your company, the customers and the style and the infographic designer only has to guess about that. 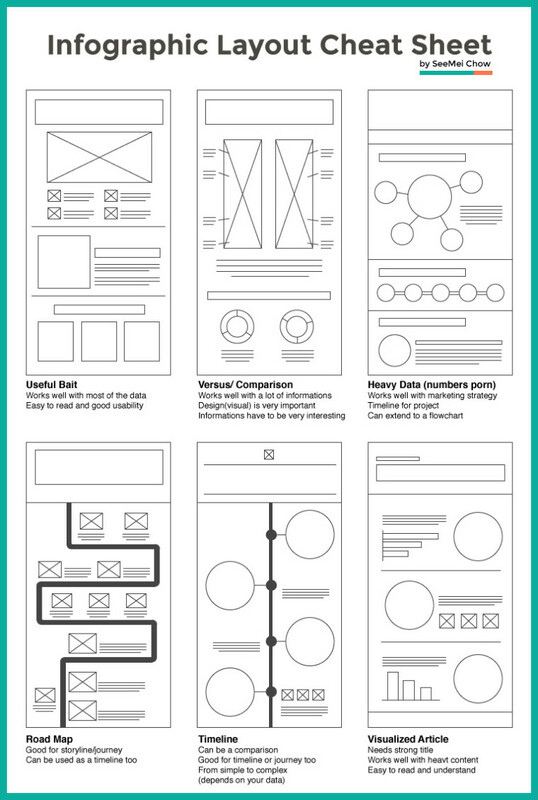 This wonderful person SooMei Chow had made an infographic cheat sheet displaying different types of layout. Does it contain your new layout too? It is a perfect starting point to start sketching your thoughts. With using images in infographics, you should be careful. Image it will spread like wildfire over the world wide web. You just don’t want to receive that one phone call from the other side of the world explaining one or more images were copyright protected and you infringed that copyright. Best is when the infographic you make about your company, also use the images you have from your company. Who the copyright owns is most obvious. In fact, you can make the photo’s with your smartphone instead of hiring a photographer. Found the images, free of possible copyright issues. Now it is time to find the infographic designer to do the job for you. Or, to save time and money, just find the designer here on infographicweb.com by browsing the infographics that are for sale with a royalty free license or an extended license.